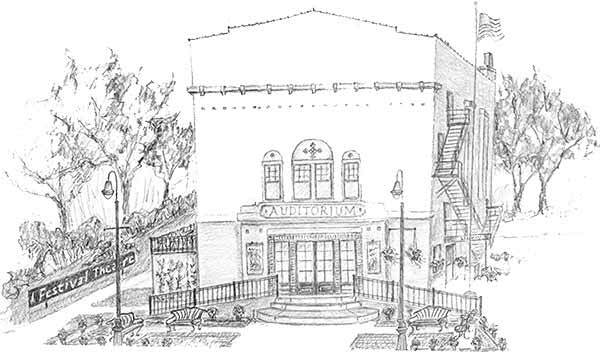 Our historic home, the Auditorium, was built in 1917 as a vaudeville playhouse. It has undergone a number of modifications since then, some of which were undone (the 1961 street front addition was removed in 1998). Within the performance hall changes include the addition of a full stage extension that has significantly increased flexibility for use in modern theatrical productions. Our 250 seat theater space features a continental floor plan in comfortable 1950's era velvet & leather seats with a lot of leg room and no seat is further than 70' from the stage. In the newly remodeled street level space is the Act II Café, our full-service coffee, wine, and snack bar. Not only can you purchase a variety of refreshments before, during and after the performance, but you can frequently meet the actors here after the final curtain. The Act II Café features the award-winning Chateau St. Croix wines and an assortment of domestic and import beer.